Discusses the skill based approach and how it is interwoven into the framework of a professional website. One of the most important factors in applying a skills based approach is properly identifying and assigning the right skills, so there are necessary attributes regarding the nomenclature of skills. First, skills must be defined based on what is commonly accepted across industries, services, and disciplines. Anyone reviewing your skill set, whether it is someone browsing your professional website, a recruiter searching through your skill set, or a career counselor helping you with career planning, must understand the precise meaning of each skill. Moreover, skills must work with your career progression so they have longevity. Second, somewhat related to the first point, there must be some way to handle skills that seem to have the same definition. For example, I am not sure of the difference between “web development” and “web design” – this is something I have run into a few times. Third, there should be some delineation between transferable skills and technical skills. You and your audience need to understand whether your skills are transferable across different disciplines or are specialized. As we discussed in the last two blogs, there are these “traditional” and “emerging” transferable skills that you will have to rely on as you adapt to rapid changes in technology, media, and demographics during your career. Furthermore, this hypothetical organization defines and categorizes new skills and sub-skills and tracks their demand; government, educators, and businesses can plan better by knowing the current and forecasted demand for particular skills. LinkedIn currently tracks the growth from year to year of skills and this is a good start. Following the demand for skills might be more effective than following the demand for careers because skills are becoming increasingly transferable across careers and disciplines. Professionals can develop their skill set and then leverage it to find careers. Of course, this hypothetical organization does not exist so we are going to build our own skill list. This brings clarity to the idea of establishing a skill set; a potential employer can understand your transferable skills, technical skills, and precisely what technologies you have experience with. A team of researchers released a very well-conceived study about what transferable skills will be in high demand in the near future; the study is called Future Work Skills 2020 and was published by Institute for the Future. To identify the skills, they derived six drivers of change (in their words): extreme longevity; rise of smart machines and systems; computational world; new media ecology; super structured organizations; and globally connected world. I am not going to discuss these drivers, but they provide a detailed discussion about them in their study. I decided to label the skills in their study, “Emerging Transferable Skills”; the skills and their definitions are in the table below (in their words only). This team of researchers used a compelling way to develop their forecast, so I suggest reading their study if you want to learn more. In summation, I might add that we are starting to experience some of the driving forces mentioned in the study, including: movement to cloud computing; shift to mobile devices; social media; and big data. They suggest these skills will be in high demand by 2020, so we should begin tooling our workforce with skills they will need for this upcoming demand; our educational institutions should prepare their curriculum to teach these “emerging transferable skills” (and this is discussed in the study under implications). In my next blog, I will discuss why we should consider “traditional” and “emerging” transferable skills as we apply a skills based approach. The discussion will be centered on properly identifying and assigning skills, so they can be effectively used in planning, building, and presenting your skill set. In this blog, I would like to discuss the idea of developing “transferable skills”. I am going to share the insights from the article: “What Do Employers Really Want? Top Skills and Values Employers Seek from Job-Seekers” by Dr. Randall S. Hansen and Dr. Katherine Hansen. They refer to “transferable skills” as “critical employability skills” – skills needed to be successful in your current employment. A transferable skill can be used in many disciplines or subjects. For example, say you are good writer, an employer may hire you to write a user manual for an application even though you have no prior experience with the application; they figure to train you with the application and then leverage your skill in writing to write the manual. So “transferable skills” are your basic foundation, which employers build upon as they teach you the intricacies of their business. The use of “transferable skills” works well with a skills based approach because connections can be made as you progress through the development of your skills. Since there are connections, it is possible to go through the four stages of the skill based approach: planning, building, presenting, and validating. You can learn “transferable skills” by taking a course or doing a project at work, and then use them to develop more finely tuned skills later in your career. The diagram below illustrates how a professional might plan to become an economist by developing various skills (the blue dots can be considered “transferable skills”). This illustration is drawn from my experiences working as an economist earlier in my career; with little professional experience, I had to first develop “transferable skills” before I could learn the more finely tuned skill of economic analysis. Communication Skills Listening, verbal, and written. Analytic/Research Skills Assess a situation, understanding varying perspectives, and gathering data. Computer/Technical Literacy Understand basic hardware and software, email, social media, and networking. Interpersonal Abilities Ability to relate to co-workers, clients, and colleagues. Planning/Organizing Ability to design, plan, organize, and implement projects and tasks. Problem Solving/Reasoning/Creativity Find solutions to problems using your creativity, reasoning, and past experiences. In the past few blogs, I discussed the results of a survey, Skills Based Approach, and in this blog I would like to incorporate what three authors write about in their articles: What’s the Cash Value of Your Brand, by Nance Rosen in Personal Branding Blog; How to Master A New Skill, by Amy Gallo in Harvard Business Review; and Why I Won’t Hire You, by Charlie Balmer in LifeHacker. These articles have valuable insights which coincide with the Skills Based Approach method; I am going to break the discussion down into the four steps of a Skills Based Approach: planning, building, presenting, and validating a skill set. As a representation of your personal brand, Ms. Rosen says: “You are inextricably tied to your measurable assets, your hard and soft skill-sets. Skills would be the ‘meat’ of your personal brand.” And this makes sense, according to the survey: most of the respondents thought a skill set is an effective representation of a professional background. Can I learn a web development language by reading a book? Should I take a course to learn about databases? How can I volunteer to gain experience with a skill? In his article, Mr. Balmer discusses reasons why he might not offer you an interview and in doing so suggests benefits in adopting a skills based approach. He says you should consider the following, “show career plans or vision… have a story about why you want to come work for him, in the specific role… don’t bother applying if you don’t have the required skills”. Of course, if you have mapped out what skills you need and how you want to gain experience with them (the planning stage of a skills bases approach), you demonstrate vision and have precise reasons why you are seeking a position and know you have matching skills for the position. During the building stage, you self-reflect on how well you are learning your skills. Ms. Gallo agrees, “Reflect along the ways, to move from experimentation to mastery, you need to reflect on what you are learning.” In addition, Ms. Gallo says you should, “Get the right help… if you can’t find a mentor inside your company, look for people in your industry or from your network.” Finding a mentor as you are learning skills is an effective way to build an expertise. Ms. Rosen also points out that you should “reach out to your audience before you need anything.” Start nurturing your relationships with possible references as you build your skill set, this way you can prepare them as they might testify regarding their experiences with you in the future. Finally, Ms. Gallo suggests being patient because developing a skill takes time. During the presentation stage, you share your skill set with others. The gist of Ms. Rosen’s article is that you need to sell yourself and having a skill set will only get you so far. She says you should, “polish your delivery and presentation skills” and “do the work to become an expert in your industry”. You need to be able to use verbal and written communication to tell your story. During the validation stage, you build credibility by validating your skills. 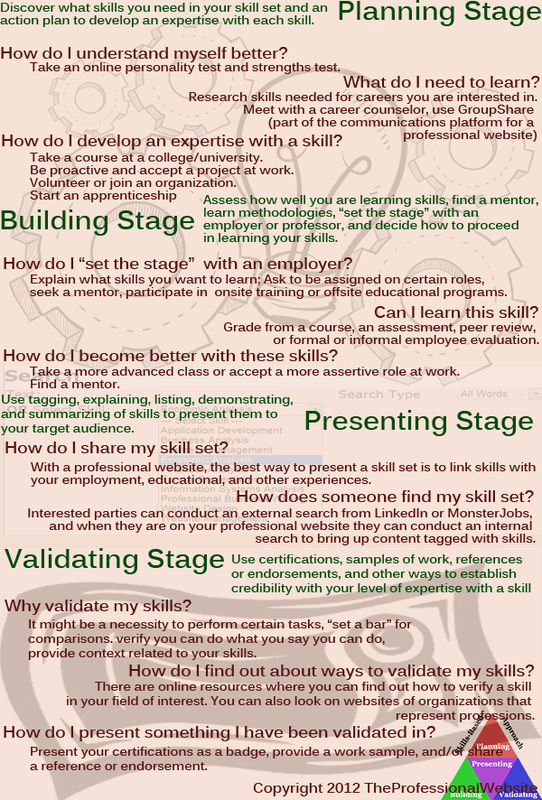 The survey addressed the most common ways to validate a skill: references, sample of work, certificate, and years of experience. Ms. Gallo brought up another way to validate a skill that I had not considered; she says to “Challenge yourself to teach it to others. One of the quickest ways to learn something new, and to practice it, is to teach others how to do it.” Cleary, you can establish credibility with a skill if you can teach it to others.